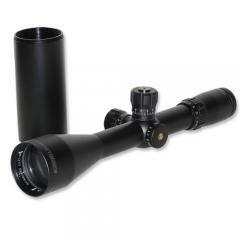 Bushnell ET6245 Elite 6-24x50 Mil Dot Tactical Riflescope ET6245 FREE SHIPPING! The Bushnell Elite Tactical 6-24x50 riflescope provides superior image quality for enhanced target identification and tracking capabilities, even at the limits of its powerful variable magnification. It features fully multi-coated optics with the advanced Ultra Wide Band Coating, an anti-reflective treatment that maximizes light transmission through an extended portion of the visible spectrum to provide exceptional brightness and clarity. The external lens surfaces also carry a permanent Rainguard HD hydrophobic coating that breaks up water droplets, reducing light scattering to preserve visibility in wet conditions. The scope comes with a Mil Dot reticle that helps with accurate range estimation, and its precise windage and elevation target turrets and side parallax adjustment allow quick compensation for distance. The rugged aluminum tube is recoil-tested against 10,000 rounds of .375 H&H ammunition. It also features argon purging technology that makes it completely impervious to water. ©2002-2019 CopsPlus.com: Bushnell ET6245 Elite 6-24x50 Mil Dot Tactical Riflescope ET6245 FREE SHIPPING!